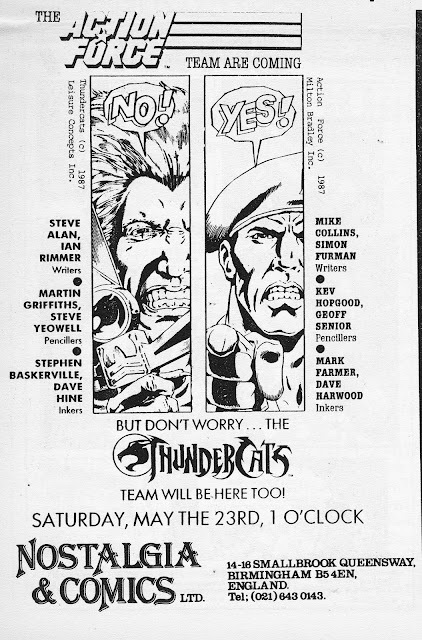 From May 1987: The Annex of Ideas takes a road trip to Birmingham for a signing by the MARVEL UK ACTION FORCE and THUNDERCATS (so also - inevitably - TRANSFORMERS as well) creative teams. Did you go? Was it good? Do you still have your signed weeklies? Did Steve Alan attend? I understood that was a nom-de-plume--I think Dan Abnett told me that it "Steve Alan" was named after the two great comic book writing Moores of the time, but I'm not sure if it was Abnett who used the pen-name or whether it was an editorial catch-all name. Any insights?